(Phys.org) -- UCLA life scientists have discovered new laws that determine the construction of leaf vein systems as leaves grow and evolve. These easy-to-apply mathematical rules can now be used to better predict the climates of the past using the fossil record. The research, published May 15 in the journal Nature Communications, has a range of fundamental implications for global ecology and allows researchers to estimate original leaf sizes from just a fragment of a leaf. This will improve scientists' prediction and interpretation of climate in the deep past from leaf fossils. Leaf veins are of tremendous importance in a plant's life, providing the nutrients and water that leaves need to conduct photosynthesis and supporting them in capturing sunlight. Leaf size is also of great importance for plants' adaptation to their environment, with smaller leaves being found in drier, sunnier places. 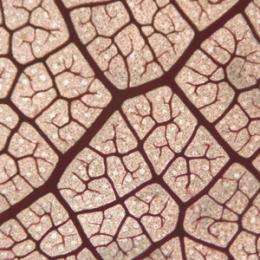 However, little has been known about what determines the architecture of leaf veins. Mathematical linkages between leaf vein systems and leaf size have the potential to explain important natural patterns. The new UCLA research focused on these linkages for plant species distributed around the globe. "We found extremely strong, developmentally based scaling of leaf size and venation that has remained unnoticed until now," said Lawren Sack, a UCLA professor of ecology and evolutionary biology and lead author of the research. How does the structure of leaf vein systems depend on leaf size? Sack and members of his laboratory observed striking patterns in several studies of just a few species. Leaf vein systems are made up of major veins (the first three branching "orders," which are large and visible to the naked eye) and minor veins, (the mesh embedded within the leaf, which makes up most of the vein length). Federally funded by the National Science Foundation, the team of Sack, UCLA graduate student Christine Scoffoni, three UCLA undergraduate researchers and colleagues at other U.S. institutions measured hundreds of plant species worldwide using computer tools to focus on high-resolution images of leaves that were chemically treated and stained to allow sharp visualization of the veins. The team discovered predictable relationships that hold across different leaves throughout the globe. Larger leaves had their major veins spaced further apart according to a clear mathematical equation, regardless of other variations in their structure (like cell size and surface hairiness) or physiological activities (like photosynthesis and respiration), Sack said. "This scaling of leaf size and major veins has strong implications and can potentially explain many observed patterns, such as why leaves tend to be smaller in drier habitats, why flowering plants have evolved to dominate the world today, and how to best predict climates of the past," he said. These leaf vein relationships can explain, at a global scale, the most famous biogeographical trend in plant form: the predomination of small leaves in drier and more exposed habitats. This global pattern was noted as far back as the ancient Greeks (by Theophrastus of Lesbos) and by explorers and scientists ever since. The classical explanation for why small leaves are more common in dry areas was that smaller leaves are coated by a thinner layer of still air and can therefore cool faster and prevent overheating. This would certainly be an advantage when leaves are in hot, dry environments, but it doesn't explain why smaller leaves are found in cool, dry places too, Sack noted. Last year, Scoffoni and Sack proposed that small leaves tend to have their major veins packed closely together, providing drought tolerance. That research, published in the journal Plant Physiology, pointed to an advantage for improving water transport during drought. To survive, leaves must open the stomatal pores on their surfaces to capture carbon dioxide, but this causes water to evaporate out of the leaves. The water must be replaced through the leaf veins, which pull up water through the stem and root from the soil. This drives a tension in the leaf vein "xylem pipes," and if the soil becomes too dry, air can be sucked into the pipes, causing blockage. The team had found, using computer simulations and detailed experiments on a range of plant species, that because smaller leaves have major veins that are packed closer together  a higher major vein length per leaf area  they had more "superhighways" for water transport. The greater number of major veins in smaller leaves provides drought tolerance by routing water around blockages during drought. This explanation is strongly supported by the team's new discovery of a striking global trend: higher major vein length per leaf area in smaller leaves. The Nature Communications research provides a new ability to estimate leaf size from a leaf fragment and to better estimate past climate from fossil deposits that are rich in leaf fragments. Because of the very strong tendency for smaller leaves to have higher major vein length per leaf area, one can use a simple equation to estimate leaf size from fragments. Major vein length per leaf area can be measured by anyone willing to look closely at the large and small leaves around them. "We encourage anyone to grab a big and a small leaf from trees on the street and see for yourself that the major veins are larger and spaced further apart in the larger leaf," Scoffoni said. Because leaf size is used by paleobiologists to "hindcast" the rainfall experienced when those fossil plants were alive and to determine the type of ecosystem in which they existed, the ability to estimate intact leaf size from fragmentary remains will be very useful for estimates of climate and biodiversity in the fossil record, Sack said. The research also points to a new explanation for why leaf vein evolution allowed flowering plants to take over tens of millions of years ago from earlier evolved groups, such as cycads, conifers and ferns. Because, with few exceptions, only flowering plants have densely packed minor veins, and these allow a high photosynthetic rate  providing water to keep the leaf cells hydrated and nutrients to fuel photosynthesis  flowering plants can achieve much higher photosynthetic rates than earlier evolved groups, Sack said. The UCLA team's new research also showed that the major and minor vein systems in the leaf evolve independently and that the relationship between these systems differs depending on life size. "While the major veins show close relationships with leaf size, becoming more spaced apart and larger in diameter in larger leaves, the minor veins are independent of leaf size and their numbers can be high in small leaves or large leaves," Sack said. "This uniquely gives flowering plants the ability to make large or small leaves with a wide range of photosynthetic rates. The ability of the flowering plants to achieve high minor-vein length per area across a wide range of leaf sizes allows them to adapt to a much wider range of habitats  from shade to sun, from wet to dry, from warm to cold  than any other plant group, helping them to become the dominant plants today." The strength of the mathematical linkage of leaf veins with leaf size across diverse species raises the question of cause. 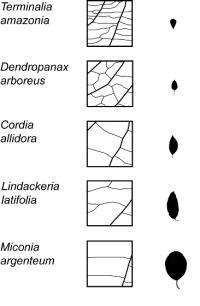 The UCLA team explains that these patterns arise from the fact of a shared script or "program" for leaf expansion and the formation of leaf veins. The team reviewed the past 50 years of studies of isolated plant species and found striking commonalities across species in their leaf development. "Leaves develop in two stages," Sack said. "First, the tiny budding leaf expands slightly and slowly, and then it starts a distinct, rapid growth stage and expands to its final size." The major veins form during the first, slow phase of leaf growth, and their numbers are complete before the rapid expansion phase, he said. During the rapid expansion phase, those major veins are pushed apart, and can simply extend and thicken to match the leaf expansion. Minor veins can continue to be initiated in between the major veins during the rapid phase, as the growing leaf can continue to lay down new branching strands of minor veins. In the final, mature leaf, it is possible for minor veins to be spaced closely, even in a large leaf where the major veins would be spaced apart. "The generality of the development program is striking," Sack said, "It's consistent with the fact that different plant species share important vein development genes  and the global scaling patterns of leaf vein structure with leaf size emerge in consequence." These vein trends, confirmed with high-resolution measurements, are "obvious everywhere under our noses," Sack and Scoffoni said. Why had these trends escaped notice until now? "This is the time for plants," Sack said. "It's amazing what is waiting to be discovered in plant biology. It seems limitless right now. The previous century is known for exciting discoveries in physics and molecular biology, but this century belongs to plant biology. Especially given the centrality of plants for food and biosphere sustainability, more attention is being focused, and the more people look, the more fundamental discoveries will be made." Can a single layer of cells control a leaf's size? Is there anyone on staff here who knows enough English to see the problem with the phrase "predictions of past climate"? within the text it's called "estimate past climate"